Archaeologists call artifacts whose identity can help date a site or structure within a site, time-diagnostic artifacts. 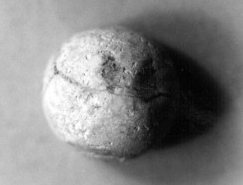 At the Bowen's Prairie sites, there were several classes of time-diagnostic artifacts. These include ceramics, window glass, brick, nails, tobacco pipes, and coins. 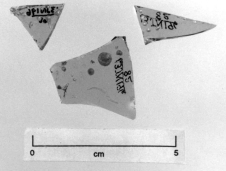 In addition, the occurrence and quantity of certain types of artifacts can provide clues to the social and economic status of the inhabitants at sites where they occur. A glossary of historic ceramic wares found at sites in Iowa with their temporal span can be can be found at www.uiowa.edu/~osa/learn/dubuque/glossary.htm. 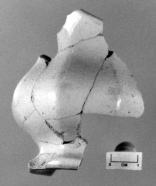 Preliminary analysis suggests that sites on Bowen's Prairie contain examples of unrefined and refined wares. Unrefined stoneware and earthenwares such as redware and yellowware, tend to be thick, heavy, and not highly decorated. Refined wares produced from a better quality paste are well fired and well glazed. They tend to be thinner and more highly decorated. 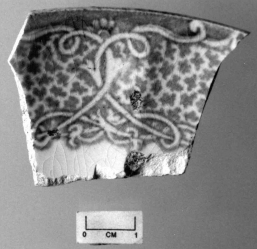 Refined wares include white pasted earthenware, pearlware, creamware, ironstone, and porcelain. Because of changes in manufacturing techniques, window glass became increasingly thick through time. 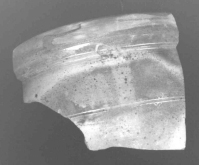 Thus, window glass thickness has been shown to be an accurate predictor of the age of historic period sites. Some of the Bowen's Prairie sites reflect decreasing thickness in window glass with the depth of fill. This helps to document the temporal span at some of the sites. Prior to the 1880s, most brick was made on site or in local brickyards. Soft mud bricks were hand molded using wooden molds. Bricks were allowed to air dry and were then fired. Because of the relatively crude firing method, bricks were unevenly heated producing variable results in firing and resulting hardness. Low-fired bricks remained light and porous while those more highly fired were often vitrified and quite hard. Most of the bricks found at the Bowen's Prairie sites represent soft mud bricks. By 1860, a professional brickmaker had moved to the area. By the late nineteenth century, a standard brick size had been established for manufactured bricks which were also becoming easier to import due to improved rail transportation. Prior to 1790, all nails had to be hand forged. After this date, machine-cut nails were produced from rectangular strips of iron plate. The heads of such nails were then hand-finished with a hammer. After about 1830, machine-headed nails were produced. Machine-made, wire nails were introduced into the United States from Europe in the 1850s. By the end of the century, they compose fifty percent of the average nail assemblage. 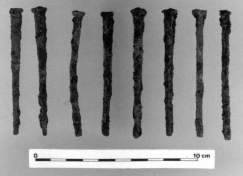 Again, the quantity and changing ratio of types of nails found at the Bowen's Prairie sites provides clues to the length of time the sites were utilized. 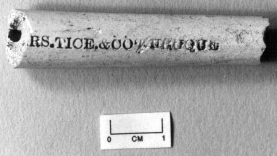 White clay (kaolin) pipes are common on archaeological sites dating before 1860. After this time, both wooden pipes and cigarettes became increasingly popular; although, certain types of clay pipes continued to be made. Clay pipes and clay pipe stem fragments occur at several sites on Bowen's Prairie. The discovery of coins on an archaeological site can provide a terminus post quem for the feature or layer in which the coins were found. This means a date on or after which the feature or layer was deposited. Several coins were found in the Bowen's Prairie excavations including one from the Moses Collins farmstead dating to 1829. 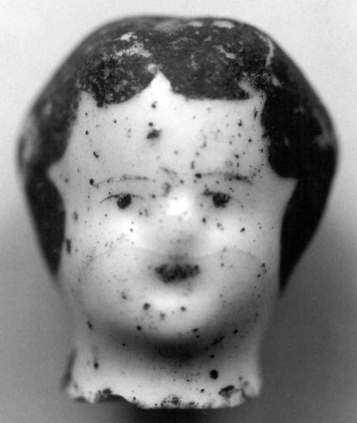 The occurrence of toys including doll parts and marbles suggests the presence of children on Bowen's Prairie. Census data, burial records, and county histories can often confirm just who these children were.